This activity engages students in learning about the meaning of prejudice, its manifestations and impact on individuals. This learning will support students’ understanding of the broader issues of individual responsibility and the consequences of our actions. Lala is a six-minute-long virtual reality film that uses both live action and animation to tell the true story of Roman Kent’s pet, Lala. An important message in the story is Roman’s belief that love is stronger than hate. In this activity, students develop an understanding of what it means to be a bystander and its impact on individuals. This Information Quest activity, connected to Mona Golabek's The Children of Willesden Lane, introduces students to the Kindertransport—the transport of child refugees from Nazi-occupied Europe to England—and how it affected the children who experienced the journey. This activity helps students understand contemporary antisemitism and its impact, including on others in society. In this activity, students will explore the meaning of prejudice and respect through testimony of individuals who tell of the impact of prejudice and the power of respect to counter it. Students will define and identify intolerance and its connection to other forms of hate and bigotry, draw evidence from audiovisual testimony on the topic of racism and antisemitism, and develop an action plan to increase meaningful human connection on campus. Students will define and discuss civil discourse, examine the impact of civil and uncivil discourse in co-curricular spaces, draw evidence from primary sources including audiovisual testimony on the topic of civil discourse, and consider strategies for its promotion. 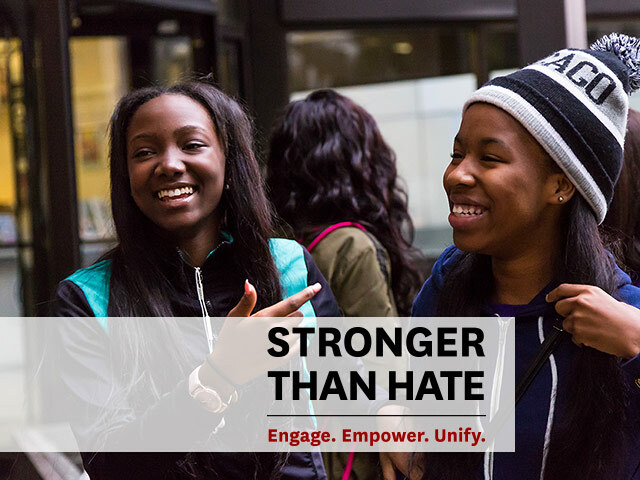 Stronger Than Hate empowers students with the knowledge, skills and dispositions they need to counter hatred and indifference in their daily lives. By engaging with the stories of survivors and witnesses of genocide, students confront the difficult reality of hate, and forge connections with real people who experienced and overcame it. In humanizing these individuals, educators can inspire their students to respect all people, and to take action as responsible participants in their communities. The library of materials on this page will be regularly updated, ensuring teachers a growing and consistently relevant collection of easily accessible testimony-based resources. Whether you are in a classroom, leading an extracurricular program, or a community project, Stronger Than Hate can support your work. We offer a variety of professional development opportunities, both face-to-face and online. Our professional development series will help educators approach real-world issues, such as those related to classroom climate and the roles and responsibilities of individuals in bringing about positive change. Click here to learn more. To bring a professional development opportunity to your school, district, or community, please contact us.